My husband and I recently moved from Los Angeles, California where we had spent the last 7-8 years of our lives. 7-8 YEARS! In just one city, we transformed. We were single in LA, got in trouble in LA, got saved in LA, got engaged in LA, got married in LA, found out we were pregnant in LA, fought in LA, laughed in LA, loved in LA, and were LOVVVVVVVED in LA. That move, truthfully, was probably one of the hardest things I have ever done. In the wake of that transition, we left some of the most incredible friends we had ever met, a beautiful and blossoming community, and a thriving city that both of us did (obviously) a lot of GROWING UP in. Well today, the heaven’s opened, the planets aligned, and somehow I was able to have a TWO HOUR….UNINTERRUPTED….phone conversations with one of my best friends, Joelle. People…TWO HOURS!!…UNINTERRUPTED!! I have two small babies!! Can I get a WITNESS!? Uninterrupted ANYTHING is a rarity in my life these days, so needless to say, it was quite the gift. After I got off the phone, I found myself quite homesick for the home I had known for so long. If you’ve ever lived in California, you know that there just isn’t any place quite like it. There is something about the sun that feels different. The people are different. The culture is different. There’s a certain California language….a certain California vibe. And I found myself CRAVING the tastes of California that comfort me. 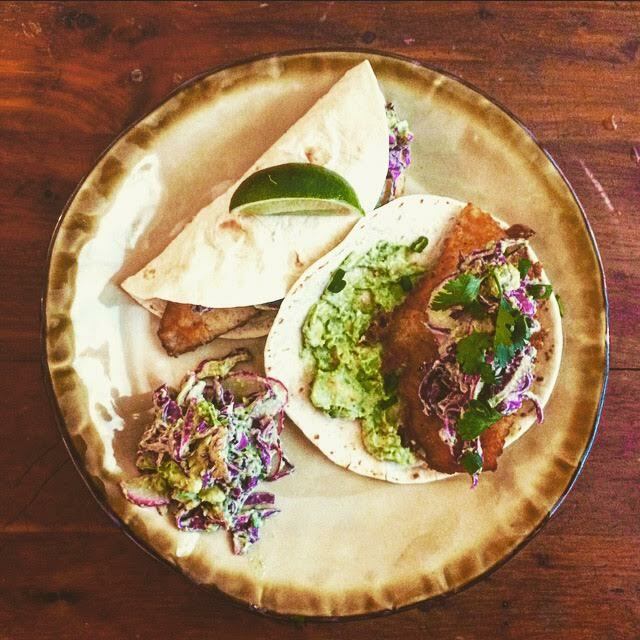 So, as luck would have it, I had one last meal to make from my Hello Fresh box, and it just so happened to be Tempura Fish Tacos with Avocado Crema and Red Cabbage-Radish Slaw. And let me tell you guys, it was a dream. It couldn’t have been a more perfect dish than if California wrapped her sunny arms around me herself. “Preheat oven to 400* F. Thinly slice the radishes. Thinly slice the scallions, keeping the greens and whites separate. Halve the lime, then cut half the lime halve into wedges. 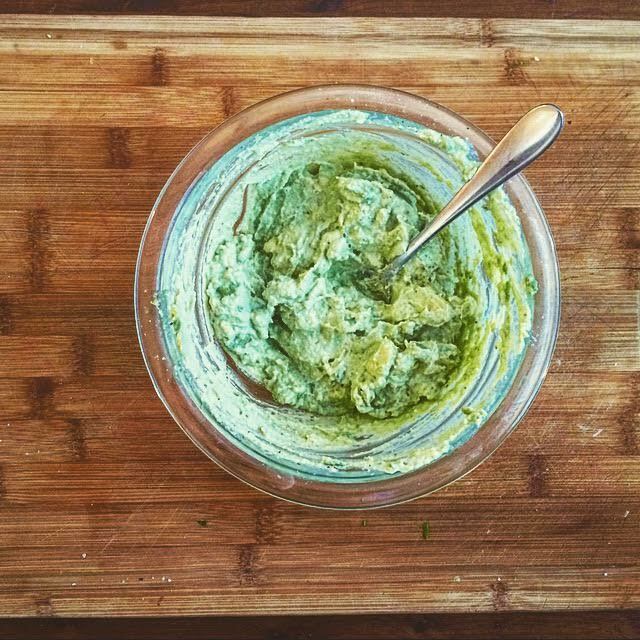 Make the avocado crema: halve, pit, and peel the avocado. Scoop the flesh into a medium bowl and mash with a fork until smooth. Mix in the sour cream and juice of half a lime. Season with salt and pepper. Set half this mixture aside in a small bowl. 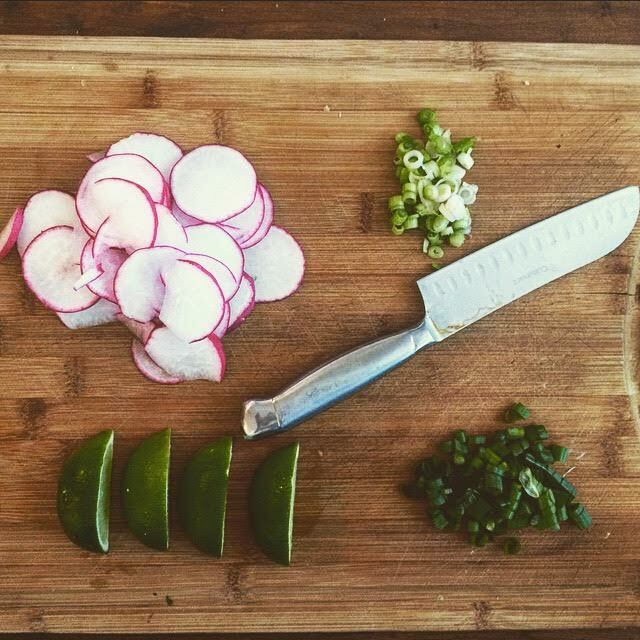 Make the cabbage slaw: toss the cabbage, radishes, and scallion whites into the remaining avocado mixture. Season with salt and pepper and set aside. Prep the tilapia fillets: halve the tilapia fillets lengthwise to create four evenly sized strips and season with half the Old Bay. 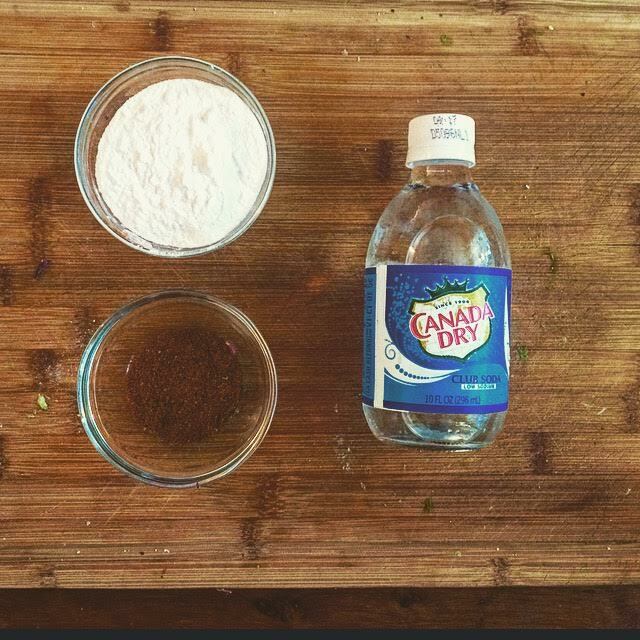 In a medium bowl, whisk together the rice flour, remaining Old Bay, and a large pinch of salt and pepper. Whisk in 1/2 cup seltzer water until smooth. 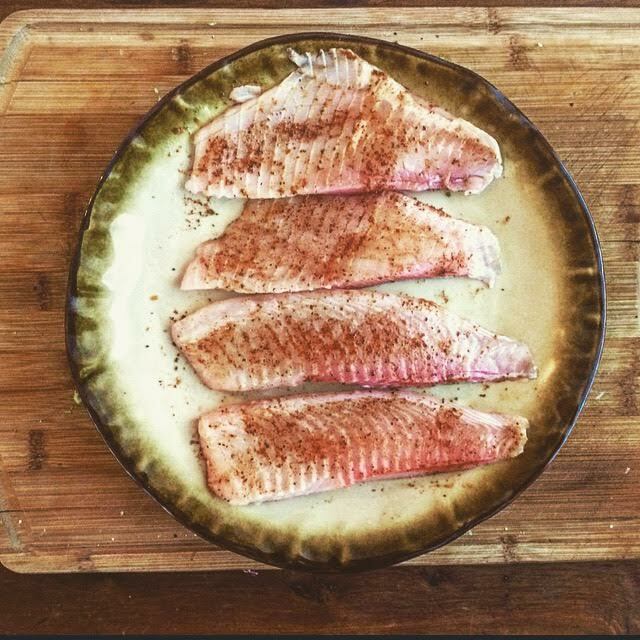 Cook the tilapia fillets: heat 1/4 inch oil in a large pan over medium-high heat. Add the tilapia to the batter and toss to coat evenly. When the oil is hot (it should shimmer when pan is tilted), add the tilapia to the pan, being careful not to splash any oil towards you. Cook 2-3 minutes per side, until golden brown and crispy. Set aside on a paper towel-lined plate and immediately salt and pepper. Wrap the tortillas in foil and place in the oven to heat for 5 minutes. Everything. Honestly. This was one of those dishes that was super clear in their directions, and everything turned out as they said it would. Nothing. However, I do note that where is says to season with salt and pepper (in multiple steps of this recipe) make sure and be generous with your seasoning. This meal could come out “bland” if not otherwise properly seasoned. To accompany this dish I suggest simple spicy black beans as well as a cilantro lime rice. Simply cook your white (or brown) rice as directed. Once cooked and forked through, add the juice of 1 lime, as well as finely chopped fresh cilantro (the amount is up to you). Season with salt and pepper to taste. I love the idea of rice flour! Being GF I am always on the lookout for new ways to make old favorites. I will definitely try this! 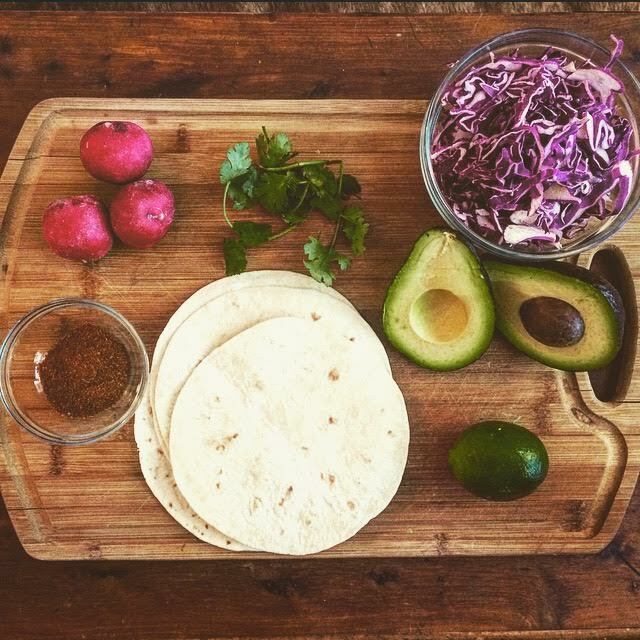 I like to make homemade corn tortillas since they are super easy and fun and GF. Mj, I loved this dish! It was super healthy (which I appreciate) but it was really delicious at the same time. adding radishes to the slaw gave the slaw a nice bright crunch. I wanted to just eat the slaw on its own! I love the idea of corn tortillas!! Let me know how it turns out for you! !